On the SQUASH blog we will regularly post pieces which highlight the innacuracies and distortions of media pieces about squatting. The following post is reprinted with kind permission from Nearly Legal, the housing law news and comment blog. I don’t read the Daily Telegraph. Frankly I’ve failed to see the point since it stopped featuring details of the salacious trial of the day as a regular fixture on page 3, because the rest of it was preposterous blimpish nonsense, mainly full of regret that Britain ever came off the gold standard. I was dimly aware that it had a re-design some years ago and was trying to be hip, which is like Tunbridge Wells re-branding itself as Barcelona, or the journalistic equivalent of dad-dancing. Still, it is a broadsheet newspaper, with small print, a serif typeface and the occasional long word, so it has pretensions to being the kind of paper that writes about fairly important things and does so, by and large, accurately. Of course we can discount the comment section, but the news on those big broadsheet pages is different, surely? It almost pains me the amount I have to go on about “media reports housing law badly.” But the Telegraph and Ken Clarke’s merry band of ‘senior sources’ at the MoJ have driven me to it again. This time, we are to be reassured that big Ken is taking tough steps to rid us of the plague of squatters who are forcing millionaires out of their homes, then occupying them for 10 years and claiming adverse possession. No such slippery behaviour and legal loophole is going to get past our Ken, and the Telegraph is here to tell us why new laws are needed and how the proposed new law differs from the old. But this time, unlike the Daily Mail, we have by-lined journalists to be rude about: Tom Whitehead ‘home affairs editor’ and Peter Hutchinson. Let us start with Tom Whitehead’s explanation of why a change in the law is needed, under the headline ‘Squatting to be made illegal’. The new law will end the “nightmare” of home owners having to fight lengthy legal battles in the courts in order to evict squatters. Instead the police will be able to force entry and arrest anyone who has occupied a property. One squatter group, known as The Really Free School, has occupied a series of properties in London, including a building in Bloomsbury Square belonging to an antiques expert and a £6 million house owned by Mr Ritchie. Then they took over an empty pub near Oxford Street before moving on to another near Leicester Square. Earlier this year, businessman John Hamilton-Brown was reduced to begging through his own letterbox for squatters to leave his £1 million home. In 2009 squatters moved into David Blunkett’s former grace and favour mansion in central London while others took over a £33 million house close to Nigella Lawson’s home in Eaton Square, central London. Squatting is not currently a criminal offence in England and Wales and instead it is up to the owners to use the civil courts to enforce their rights, which can turn in to lengthy and expensive legal battles. They must also prove to the courts that they are either a ”displaced residential occupier” – someone who has returned from holiday to find squatters in their house – or a ”protected intended occupier”, who is intending to move into an empty property. In contrast, squatters are also protected by other laws, including the Criminal Law Act 1977, which prevents a home owner forcing their way back in because it makes it an offence to use violence to gain access when there is someone on the premises who is opposed to entry. They can also take advantage of the controversial law on “adverse possession”, which can allow someone who has occupied a building for 10 years to claim ownership of it. As anyone should know, this is in large part utter nonsense, bilge and hogwash. But in order to remove trespassers, one doesn’t have to prove that one is a displaced residential occupier, or protected intended occupier. One just has to show that you have right to the land and that the trespassers are occupying without permission or authorisation. This is indeed a civil claim and can take some time. Mr Whitehead appears to be presenting a con-fused botch of the current law, which is both inaccurate and has serious omissions. He either made this complete farrago up himself, or was sold a pup by Ken Clarke’s ‘senior source’ and didn’t bother to do the most elementary fact checking. “Ken has had enough of seeing hard working home owners battle to squatters out. He is determined to use the full force of the law to save people from the nightmare of having to fight to get their houses back. Hmm. I’ll come back to this. But can one hope for clarity, or at least accuracy from the other article, which purports to set out the changes? Squatting is a civil offence against the landlord/owner of the property, which to all intents and purposes means that it is an unlawful practice, but not illegal. You can be convicted of a criminal offence if you have caused damage to the property by gaining entry, covered under the Criminal Justice Act 1994. Use of electricity etc is also a crime as it is theft. The landlord/owners are well within their rights to evict squatters, but they must go to a civil court in order to gain a possession order. 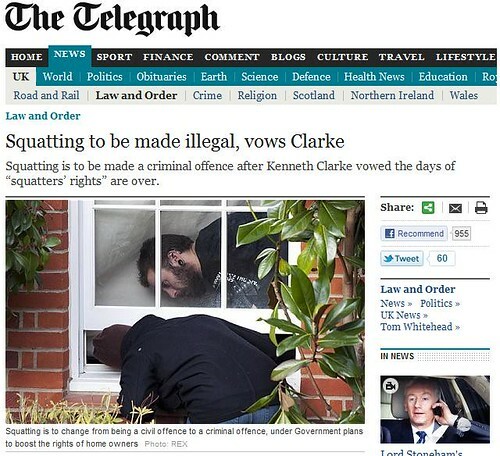 Squatters do have limited rights. A landlord cannot remove you by violent or forced means, only through the legal process. So, no. Not accurate. The same muddle of omissions and inaccuracies, in fact. And what of Ken Clarke’s proposals? The new law will make squatting a criminal offence rather than a civil offence and end the lengthy process of home owners having to fight legal battles in the civil courts in order to evict squatters. It will allow police to force entry and arrest anyone who has occupied a property. Squatters could even face a prison sentence under the plans if prosecuted. Home owners don’t have to go through a lengthy process of legal battles in the civil court, as long as they are a displaced residential occupier, or protected intended occupier, so that much is bilge as before. But what is now clear is that this situation isn’t the target of the proposals. It is not about the squatting of people’s homes – that is already a criminal offence – it is about the squatting of other property, unoccupied or without an intended occupier. The proposal isn’t even about ‘squatting’ per se. The proposal is nothing less than to criminalise trespass. The Telegraph, and Messers Whitehead and Hutchinson, have either made up this nonsense about people unable to recover possession of their own homes, or, as may be more likely, they have fallen for a bait and switch by the Home Office/MoJ, and been sold a juicy story about protecting homeowners, when the actual proposals are about something else entirely. Messers Whitehead and Hutchinson would appear to have swallowed it wholesale, without any checking whatsoever. For this example of quality journalism, onto the naughty step they go. Things get murkier. The Sunday Telegraph has a piece by Grant Shapps announcing the forthcoming change in the law and the release of booklets on property owners rights against squatters. I seem to recall these being announced quite some time ago, but assuming they contain the correct law (and Shapps does appear to have it more or less right), they would be a useful read for the Telegraph hacks. However, it turns out the the Sunday Telegraph has been running a campaign on tougher squatting laws, again banging on about homeowners, although their example is of a BTL landlord. Now, criminalising trespass was Tory policy before the election. Mr Pickles, in particular, was very keen on it in relation to gypsy and traveller unauthorised parking up. It appears that the (Sunday) Telegraph going on about homeowners – and by the quotes, being encouraged to do so by the Home Office and MoJ – has given the Govt a convenient PR line on which to sell the proposal; that it is about protecting your home from nasty, freeloading artist types. It appears the Telegraph hacks have been what Lenin would have called ‘useful idiots’.